Star Trek TOS Communicator is Now Real; Trekkies Rejoice. | OhGizmo! Star Trek Communicator based on the original Star Trek series. The Communicator pairs with your Bluetooth-enabled phone to deliver an authentic Star Trek experience complete with genuine sound effects, including the must-have chirps, plus crew voice clips from the Star Trek Universe. Feel like Captain Kirk with authentic flip-to-answer action calling. Relive your childhood dreams of asking Scotty, or in this case maybe your friend Mike, to beam you up. Rest assured, the communicator is the real deal, utilizing structured-light 3D scans taken of the Alpha Hero Prop making it the most accurate replica ever made. Including a stand and featuring contactless charging, it does provide some legit space-aged features. Beaming up to the Enterprise may still be in the works, but this is a solid start. 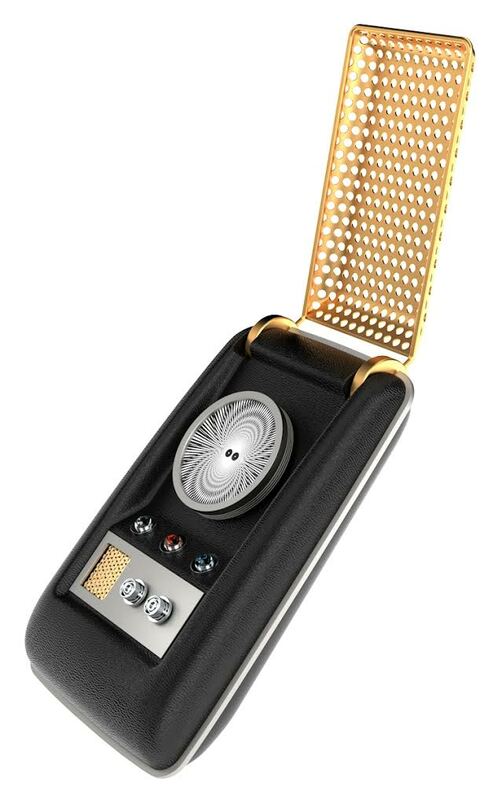 The Star Trek TOS Communicator is available for pre-order at StylinOnline.com for $149.99. ThinkGeek has had this out for well over a year now.